I can’t tell you how sad I feel that our magical Christmas is over. I spent a solid week offline, surrounded by loved ones and drinking in every last drop of festive spirit. It was heaven. But, all good things must come to an end, and it is in only experiencing the not-quite-so-magical days, that enable us to truly treasure the magical memories we get to enjoy at a time like Christmas. I’ve been in a bubble of love and I don’t want it to end! Endless days of no routine, no school run, late nights, late mornings, over eating, laughing, snuggling, relaxing. But alas, tomorrow sees the return to work for Stuart and the end of our magical Christmas as a family. I am so grateful I have a job that I love and I haven’t got the dread of returning to work. In fact I’m more excited than ever to get back to it as next week sees Georgie start 2.5 days of preschool and a whole new era for me in terms of working. I can’t believe I am going to have so many hours to work and be able to structure my week so much more efficiently. I am excited for 2018 and all that it will bring. 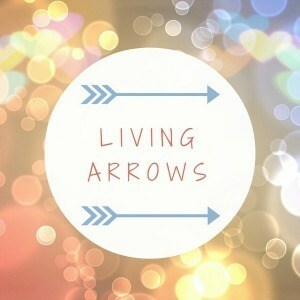 Today I wanted to join in with Living Arrows as I love the idea behind it and I’m determined to join in with more linkies this year, and I know Donna’s is the perfect place to start! So here I am, sharing some of my favourite snaps of our memories of a magical Christmas! Throughout the holiday I spent much time reflecting on the year, feeling gratitude for everything I have and particularly our health and the little life we’ve created, and especially thinking of the people who weren’t surrounded by love or family on Christmas day. I never take for granted what we have and there is so much to look forward to in the year ahead, let’s get started!! Happy 2018, I hope it’s a good one for you all! Previous Post Guest Post: 18 Things To Say Yes To In 2018. Next Post Winter Walks As A Family Of 4. Beautiful Christmas. In the new year, I hope you and your family healthy and happy. Beautiful photos. Sounds like the perfect Christmas. I hope the new year is treating you well so far.